Lewis Hamilton's gone and done it again. That's right, for third time in a row Hamilton has managed to clinch pole position, and while that might be an excellent result for the Mercedes AMG F1 team, the race could pan out to be a truly challenging task. Hamilton himself admitted that he had been surprised by the pace of the car and also surprised by the fact that he'd managed to clinch pole. Especially given the fact that it was Sebastian Vettel who seemed likely to start the race from first on the grid. Indeed, in the final few minutes of Q3 it looked unlikely that anyone would be able to better the Red Bull driver's time - a time that was 0.8 secs better than the rest of the field. The man who came the closest to Vettel was Lotus driver Romain Grosjean. Until, of course, Hamilton swooped in and clocked 1min 19.388secs, 0.038 faster than Vettel. Vettel starts second on the grid with Grosjean third. The second Silver Arrow of Nico Rosberg made it to P4, ahead of Ferrari's Fernando Alonso. Kimi Raikkonen, in the second Lotus, will start fifth, with Felipe Massa right behind him. Indeed, ever since Mark Webber announced his retirement from F1, Daniel Ricciardo, the Toro Rosso young gun, has been eyeing his seat. The direct result of that has, of course, been that he's started performing much better. 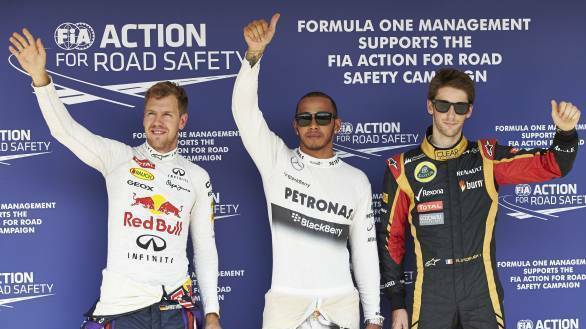 At the 2013 Hungarian GP Ricciardo will start 8th, five places ahead of his team-mate Jean-Eric Vergne. Sergio Perez was the sole McLaren in Q3, finishing ninth fastest. While Mark Webber had a disappointing afternoon, with a KERS failure that will see him start tenth. With track temperatures at Hungary around 50 deg C, tyre wear will play a major role in the race. The Mercedes cars are very likely to fall behind, while we just might see Lotus repeat their performance from last year. Winning the race and breaking his Hungarian GP curse could well be Sebastian Vettel. Don't miss this race!